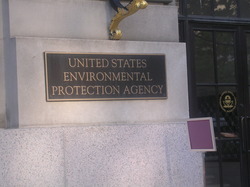 An environmental group known as the Center for Biological Diversity just sued the EPA under the Freedom of Information Act. The Center requested that the EPA make public EPA chief Pruitt’s email communications with polluters like oil companies and pesticide manufacturers. The Center wants to know if, while he has been the EPA chief, Pruitt is behaving like he always has when he holds public office, i.e., doing the bidding of polluters, unremorseful about the damage he is doing to the citizens whose health he is charged to protect. Naturally, the EPA-now under Pruitt’s control-refused to turn over a single piece of paper. But Pruitt’s communications with these polluters are not secret; under the law, the public has the right to see them. Let’s hope the Center is successful in its suit, and gets these documents that Pruitt wants to keep secret. And let’s hope it’s the next step in Pruitt leaving the EPA in disgrace, as he deserves.